We have followed events in Opelika's network project for almost two years. In addition to creating a smart-grid for its municipal electric utility, the City plans to offer triple-play services. We previously covered Charter Cable's astroturf campaign to oppose the network and how the campaign failed when Opelikans passed the referendum. Site work is well under way on the $3.7 million facility, which leaders say will be an integral part of the fiber-optic network being built throughout the city. In addition to housing the administrative office and warehouse, the facility will also be the home of Opelika Power Services’ fiber hub. 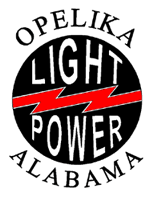 Mayor Gary Fuller notes how the people of Opelika entered the business of municipal utilities over one hundred years ago, when the community purchased the then-private electric utility. He spoke about how the people of Opelika carry on that self-reliant streak with their new fiber network. According to, Beth Ringley, Interim Director of Opelika Power, 90% of the fiber is installed underground throughout the city and should be nearly completed by the end of the summer. The $41 million project is scheduled for completion in the spring of 2013 and the first customers are expected to connect at that time. Two videos offer further coverage of this new community network. Sounds like the Scottsboro Electric Power Board is doing well. They offer fiber-optic services to businesses in addition to the cable services they offer to the general public. Our Cable employees have also had a busy summer. We are experiencing a good bit of growth in business phone line installations and fiber optic data installations. Our phone partner Knology (based in West Point, Georgia) is doing a great job for us. Knology provides the telephone switching and long distance connections so we can concentrate on customer connections and customer service. Knology seems to have partnered with a number of muni networks to offer telecom services.